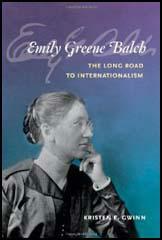 Emily Balch was born in the Jamaica Plain neighborhood of Boston, Massachusetts on 8th January, 1867. Her father had been a strong supporter of Abraham Lincoln during the American Civil War. According to Harriet Hyman Alonso: "Her father had a Union connection with the Civil War... As a result, racial justice was also a topic for discussion in the environment in which she grew up." After graduating from Bryn Mawr College in 1889, Balch continued her studies in Paris and Berlin. On the arrival back in the United States she attended the University of Chicago before beginning her teaching career at Wellesley College. During this period he published Outline of Economics (1899) and A Study of Conditions of City Life (1903). Gradually, her political views became more left-wing and in 1906 she declared herself to bge a socialist. Balch was a regular visitor at Hull House and developed a close friendship with its members including Jane Addams, Ellen Starr, Julia Lathrop, Florence Kelley, Edith Abbott, Grace Abbott, Alice Hamilton, Mary McDowell, Mary Kenney, Alzina Stevens and Sophonisba Breckinridge. Balch studied the life of immigrants in Chicago. 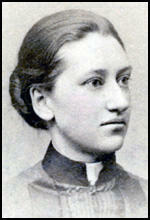 Her research resulted in the book, Our Slavic Fellow Citizens (1910). On the outbreak of the First World War, Balch and a group of women pacifists in the United States, began talking about the need to form an organization to help bring it to an end. On the 10th January, 1915, over 3,000 women attended a meeting in the ballroom of the New Willard Hotel in Washington and formed the Woman's Peace Party. Addams was elected chairman and other women involved in the organization included Mary McDowell, Florence Kelley, Alice Hamilton, Anna Howard Shaw, Belle La Follette, Fanny Garrison Villard, Jeanette Rankin, Lillian Wald, Edith Abbott, Grace Abbott, Mary Heaton Vorse, Freda Kirchwey, Charlotte Perkins Gilman, Crystal Eastman, Carrie Chapman Catt, Emily Bach, and Sophonisba Breckinridge. In April 1915, Arletta Jacobs, a suffragist in Holland, invited members of the Woman's Peace Party to an International Congress of Women in the Hague. Jane Addams was asked to chair the meeting and Balch, Alice Hamilton, Mary Heaton Vorse, Julia Lathrop, Leonora O'Reilly, Sophonisba Breckinridge and Grace Abbott went as delegates from the United States. 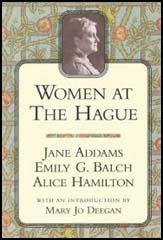 Others who went to the Hague included Emmeline Pethick-Lawrence, Emily Hobhouse, (England); Chrystal Macmillan (Scotland) and Rosika Schwimmer (Hungary). Afterwards, Balch, Addams, Jacobs, Macmillan and Schwimmer went to to London, Berlin, Vienna, Budapest, Rome and Paris to speak with members of the various governments in Europe. During this time they met Edward Grey (13th May), Herbert Asquith (14th May), Gottlieb von Jagow (21st May), Theobold von Bethmann-Hollweg (22nd May), Karl von Sturgkh (26th May), Théophile Delcassé (12th June) and Rene Viviani (14th June). Balch was also a member of the Women's International League for Peace and Freedom (WILPF). As a result of her anti-war activities, Balch was dismissed as professor of political economy at Wellesley College. She now concentrated on her peace work and became secretary of the WILPF (1918-22 and 1934-35). However, the emergence of Adolf Hitler changed her views on pacifism. She wrote: "It is not enough to sweep before your own door, nor to cultivate your own garden, nor to put out the fire when your own house is burning and disinterest yourself, as the diplmats say, when the frame house next door is in flames and the children calling from its nursery windows to be taken out." Balch won the Nobel Peace Prize in 1946. 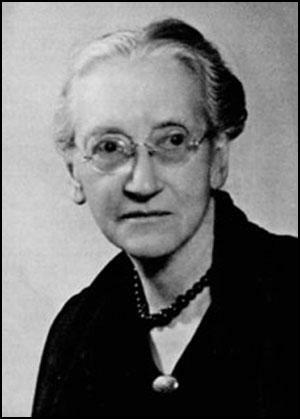 In her later life Balch wrote several important books including Refugees as Assets (1939), One Europe (1947) and Toward Human Unity, or Beyond Nationalism (1952). A few weeks before she died she wrote in her diary: "I am bringing my days to a close in a world still hag-ridden by the thought of war, and it is not given to us in this new atomic world to know how things will turn out. But when I reflect on the enormous changes that I have seen myself and the amazing resiliency and resourcefulness of mankind, how can I fail to be of good courage." Emily Balch died aged 94 in Cambridge, Massachusetts, on 9th January, 1961. Among the women attracted to the work of the Woman's Peace Party was Emily Greene Balch. Balch's early years held much in common with Jane Addams's. She was born on January 8, 1867, in Jamaica Plain, Massachusetts, and her father had a Union connection with the Civil War, as did Addams's. As a result, racial justice was also a topic for discussion in the environment in which she grew up. After attending private schools in Massachusetts, where she lived, Balch attended college at Bryn Mawr, graduating in 1889 with a degree emphasizing economics. She also studied political economy at the Surbonne. The results of her research were published in 1893 by the American Economic Association as Public Assistance of the Poor in France. Once at home, Balch became entrenched in the work of Progressive reform, especially with women interested in working among the poor. In 1892, while attending Felix Adler's Summer School of Applied Ethics, she became friendly with Jane Addams and Vida Scudder. The latter, along with Balch and others, the next year founded Denison House, a settlement house in Boston. Unlike Addams, however, settlement house work itself did not stimulate Balch, whose primary interest was in the academic world. After some soul-searching and further studies, in 1896 she accepted a position on the faculty of Wellesley College, where commitment to social reform influenced her work and teaching on issues of the poor, immigrants, Women, and racial minorities. In 1906 Balch openly declared herself to be a socialist, a position that made her vulnerable to criticism by the college and local and national authorities. By 1910, however, with the publication of Our Slavic Fellow Citizens, a comprehensive analysis of an immigrant community, Bach had established herself as a sound scholar. She received a new five-year appointment as professor and chair of Wellesley's Department of Economics and Sociology. After August 1914, Balch's and Addams's paths intertwined frequently. A pacifist since 1898, Balch, too, was deeply disturbed by the outbreak of war in Europe. As she recalled, "When the World War broke out in 1914, my reaction to it was largely a sense of tragic interruption of what seemed to me the real business of our times the realization of a more satisfactory economic order. ... Now all the world was at war, one hardly knew for what for reasons of ambition, prestige, mutual fear, of frontiers and colonies. None of the war aims seemed very relevant to progress, in any important sense." (Emily Balch, Working for Peace, May 1933). At first Balch took the sarne path as Jane Addams. She was active in founding the American Union against Militarism and establishing the Wonlan's Peace Party, especially the Boston and Wellesley branches. In the spring of 1915 she even took a leave of absence from Wellesley in order to attend the congress of women in The Hague. That event led to her full-time professional commitment to peace activism. I am bringing my days to a close in a world still hag-ridden by the thought of war, and it is not given to us in this new atomic world to know how things will turn out. But when I reflect on the enormous changes that I have seen myself and the amazing resiliency and resourcefulness of mankind, how can I fail to be of good courage.